AOIFE MURRAY WILL captain Cork in her 17th season at inter-county level this summer, something she is more than happy to do, for her family in particular. The 34-year-old has eight All-Ireland medals, the most recent being won in a dramatic decider last September where a last gasp point ensured that the O’Duffy cup would return to the Rebel county. Her brother, Paudie Murray also played for Cork and now manages the county’s camogie side. The goalkeeper has cited Paudie’s involvement in management this year as a reason for her decision to commit in 2018. It’s very much become a family affair for the Murray’s and with both her and her brother at the centre of another Cork All-Ireland push in 2018; Aoife just wants to give her parents more good times in red before she retires. “I did obviously give calling it a day quite a lot of thought. When the management said that they were going back, the full contingent, some of those are family and you say ‘you can pick your friends but not your family’. “I think once they went back, I suppose I want to give my father a few more good days in the sun. It’s a massive opportunity for him to look forward to these kind of games and the same with my mother. “If we can, as a family, give them a few more good days out, listen (I’ll be happy)” she said, speaking at the launch of the Liberty Insurance All-Ireland Camogie Championships. 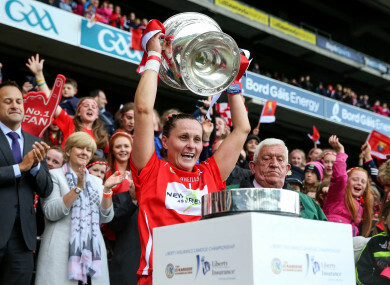 Cork’s 2018 aspirations were dealt a massive blow in May when Rena Buckley announced her inter-county retirement, the dual-star had won 18 All-Ireland titles across both codes. Murray, however, is adamant that the team can still perform well in her absence but acknowledged the loss of a valuable leader in the dressing room. “I suppose she hadn’t been around for the National League so we had gotten used to that kind of environment without Rena. “Of course she will be missed, she’s a very level-headed team-mate to have in the dressing room, (she) normally says the right thing at the right time. “She will be missed on a personal level as well, she’s good friends (with me) so you will always miss those friendships you’ve built up over 15 years or so but when a door closes, another one opens and that just means there are opportunities for other girls now. Cork’s Championship Group 2 opener against Waterford takes place on 9 June. Email “'I want to give my father a few more good days in the sun' - Aoife Murray on a 17th season with Cork”. Feedback on “'I want to give my father a few more good days in the sun' - Aoife Murray on a 17th season with Cork”.